To juice or not to juice, SIRT foods or Paleo, Hemsley & Hemsley vs. Amelia Freer’s Eat Nourish Grow. The road to healthy eating has never been more plentiful and accessible but paradoxically it can also be tricky to navigate. On any given day the Peck & Chisel team will experiment with new green juices, sugar free brownie recipes and the latest vegetable alternatives to rice and pasta. But for us, there is one healthy alternative that has truly stuck – The Energy Bite. Sure the energy bite (also referred to as the energy ball) isn’t anything new, and is small in statue, but it packs a big protein punch, is easy to make and is the ideal afternoon snack, fitting perfectly into almost any handbag. 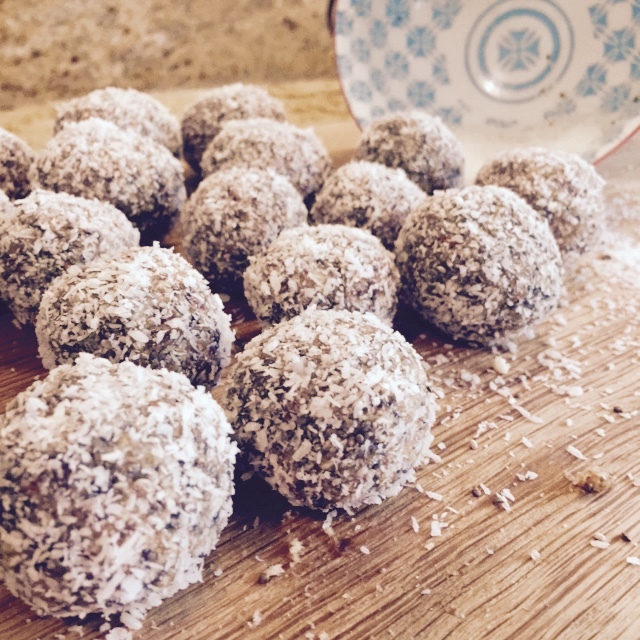 Being self professed pros of the energy ball, we at Peck & Chisel wanted to share our all-time favourite recipe – Chia, Date and Coconut. The best thing about this variety is that all ingredients are 100% natural, but the finished product tastes like a deliciously decadent square of chocolate, with added protein benefits. Tip 2: Wrap a couple of these balls in baking parchment and take them on a cycle ride – they fit perfectly in the rear pocket of cycling jerseys and the baking parchment helps keep them moist and yummy. Tip 3: These energy bites go down a treat at summer picnics and if you’re not a massive fan of coconut, roll the balls in the dark cocoa power instead for that extra bit of decadence. 1 – Place almonds and cashews into your food processor/blender and process until they are ground into a fine flour. Don’t turn them to dust though we still have some more processing to do and we want our energy bites to have a little texture to them. 2 – Add dates, vanilla and cinnamon and process until well combined. 3 – Add chia seeds along with 2 tablespoons of your shredded coconut and process until combined. If you find your “dough” is a little dry add a splash of water and process again. 4 – Use your hands to roll your delicious “dough” into bites size balls and set aside FYI – I use approx 1 heaping teaspoon per bite. 5 – Place your remaining tablespoon of shredded coconut into a small bowl and gently roll some of your delicious little bites to coat. I chose to coat half of my bites in coconut and left the other half plain if you want to coat all of your bites simply use more shredded coconut. 6. Store in the fridge in an airtight container for up to 2 weeks.